Purpose: Use this document as a reference for enrolling and updating life and AD/D benefits in ctcLink. NOTE: As of 1/1/2017, HCA passed administration of life insurance to MetLife. This QRG can be used to access records of employees prior to 1/1/2017 who possess a historical record of Life coverage in PeopleSoft. For more information, see MetLife Interface and Transmittal QRG. NOTE: To see current enrollment selections for an employee; navigate to: Main Menu > Benefits > Review Employee Benefits > Current Benefits Summary. 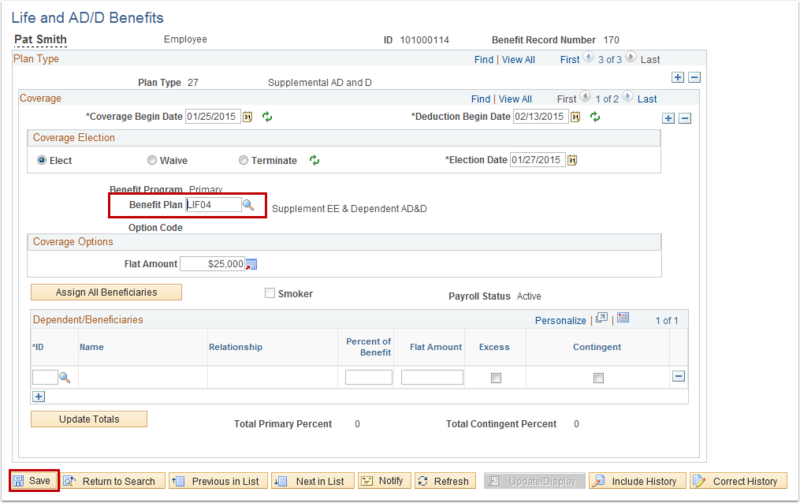 If the employee has other Life and AD/D Benefits Plan Types, click the Add A Row (+) button in the Plan Type section to add a new plan type entry for the selected employee. Click the lookup button to select the plan type. On the Life and AD/D Benefits page, click the Add a Row (+) button in the Coverage section to add a new coverage entry for the selected employee. Enter Coverage Begin Date to specify the date when the coverage period for the updated election starts. Enter Deduction Begin Date to specify the date when the employee starts contributing to the benefit plan. NOTE: Keep payroll dates in mind when determining the Deduction Begin Date. The Benefit Plan field will automatically populate. Click the Benefit Plan field lookup icon to select additional options for the plan type selected. The Coverage Election Date will default to today’s date unless otherwise specified.